Leaf, with initial A (God the Father presenting Christi Child to a group of saints, including one pope, two monks: attributed by Kanter to Silvestro dei Cherarducii and by Levi D'Ancona to the Maestro delle Canzoni). Related fragments are in the Pierpont Morgan Library, National Museum, Stockholm, Kuferstichkabinett, Berlin, Musée Marmottan, Paris; Museo Civico, Padua; British Library. Pub. 1908 cat, 84; 1923 cat, 77-78 ; Levi D'Ancona, 1993, II p. 25, fig.1; Kanter, 1994, p. 157. 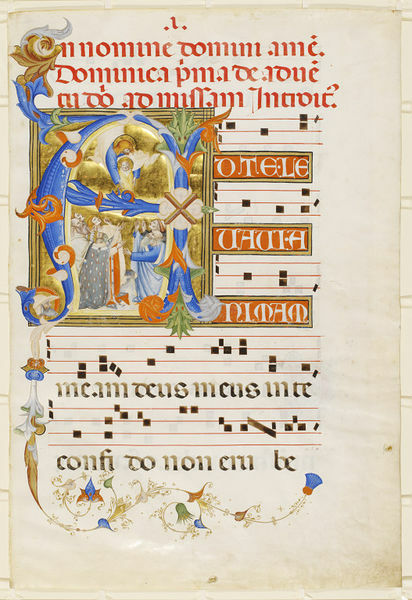 Leaf from gradual with historiated letter A depicting God the Father presenting Christ Child to a group of saints, including one pope and two monks. 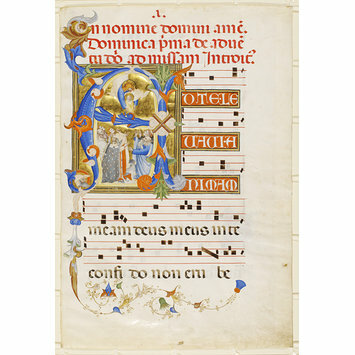 Attributed to Silvestro dei Gherarducci and also to Maestro delle Canzoni. Florence 1392-1399. A duplicate number MS.964 was assigned to this object in error and was subsequently cancelled.